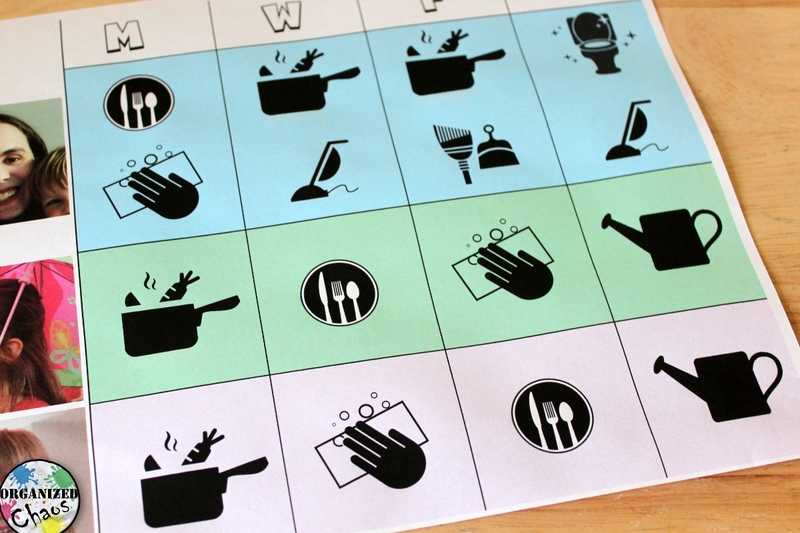 So last week my 4-year-old's made dinner together (including planning the menu) on Monday, then took turns setting and clearing the table the rest of the week. The girls have been helping with getting out and putting away their dishes and even food prep for a couple of years now, but it was a big change for me to put them completely in charge of those responsibilities. I never imagined they could do it at such a young age, but so far we are all quite enjoying it, and it doesn't hurt that the girls are learning some important skills and values in the process! 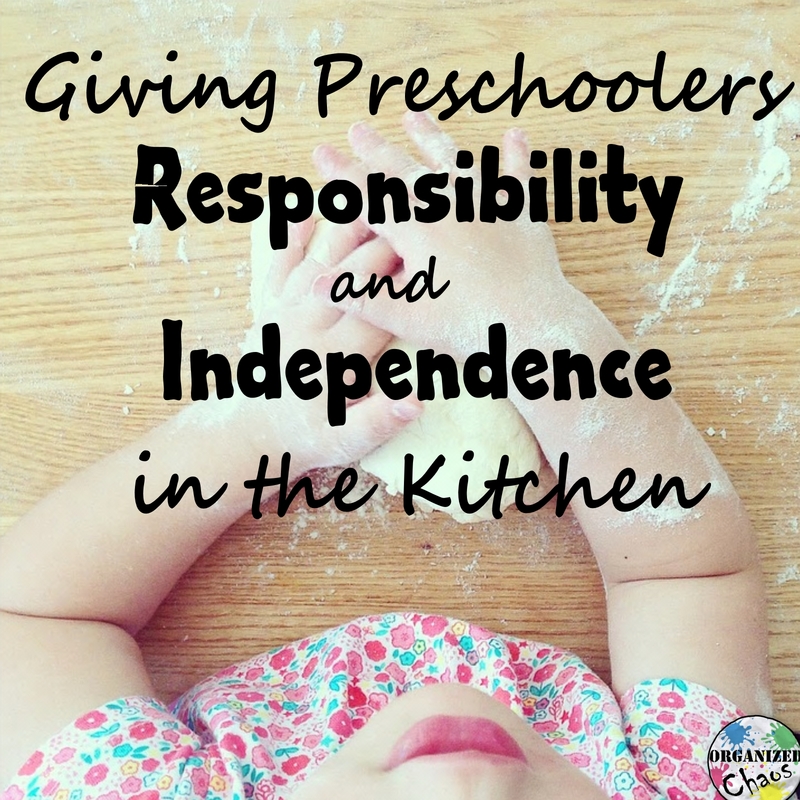 Here are my tips for giving your preschoolers more responsibility and independence in the kitchen. The first meal my girls settled on? Hard boiled eggs, biscuits (from a can), broccoli, and apple slices. Definitely not the kind of meal I would choose, but certainly not very unhealthy either. I found it effective for me to tell the girls that when you are making dinner, you are supposed to choose a fruit, a vegetable, a carb, and a protein (I explained what the last two categories were by giving them examples), and then letting them each pick the item for two categories. Breaking it down that way not only made it easier for them to come up with a full meal plan, but it also ensured that we were getting a relatively balanced meal. And although I will admit to grimacing a bit when they made their selections, I stopped myself from saying anything about what would taste good together or making any other suggestions. I think they felt a greater sense of ownership and responsibility from having come up with the meal plan all by themselves. 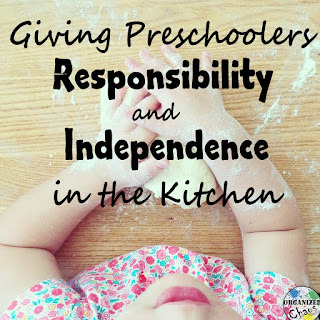 It's hard for me to not step in when the kids are doing something in a messy or difficult way when I could easily show them how to do it "better", but if my goal is to give them more independence and responsibility, I need to let them mess up sometimes. They'll learn a lot faster by doing things and figuring it out on their own anyway! I told the girls in advance that I would do all of the cutting myself and I would help them turn on the gas ranges, but they would be on their own for the rest. I stayed in the kitchen and answered any questions they asked, but did not offer any unsolicited advice or assistance. You know what? They did great! I have plastic dishes from IKEA in a low cabinet where the girls can reach them. No matter what kind of dishes you are using, there are two keys to getting kids to set out and clean up dishes independently: putting them where they can reach them, and being prepared for the possibility that they will be dropped. I've actually started letting the girls use the "grown up" dishes as well, but they are not super expensive ones, nor do they have sentimental value, so I don't have to be too stressed out about one of them breaking (or at least that's what I keep telling myself). Don't make them feel badly for dropping dishes if you're asking 4-year-old's to help. 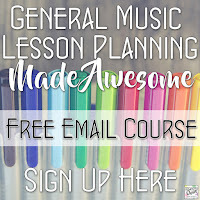 You want this to be fun, not stressful! If all of your dishes are too difficult to part with, pick up some cheap plastic ones to use until the kids are older. One of the best things about giving young children more responsibility around the house is developing a sense of being an important, contributing member of the family. When I decided to start having the girls take more ownership in cooking and cleaning in the kitchen, I put together a quick chore chart that included their jobs and mine. 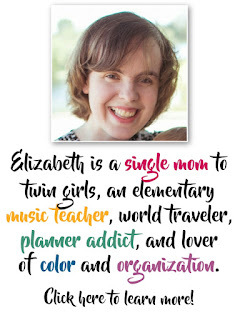 It's a win-win really: they can see how we are sharing responsibility rather than being forced to do stuff while I sit around eating bon-bon's, and it serves as a cleaning schedule of sorts for me as well to keep me on track! Have you set your kids loose in the kitchen yet? Let me know if you decide to try- I'd love to hear what works and what doesn't work for you!